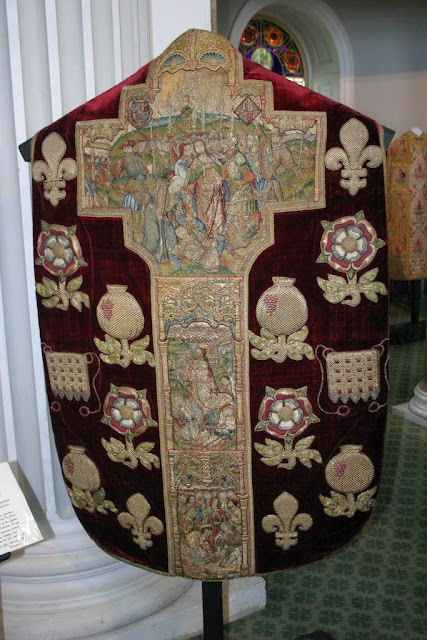 We have been showing you various vestments from the collection of the English recusant Wardour Chapel. I am grateful for Brother Lawrence pointing out another set of private photos, which the photographer, Maxwell Steer, kindly gave us the permission to reproduce. The full photoset is here, but in particular I would like to show you this particular chasuble which includes some rather interesting designs and details. The embroidery is derived from two vestments formerly used in Westminster Abbey, later made into one single crimson velvet chasuble. The orphreys are late 15thC Flemish work. The scenes are of Christ washing the disciples' feet in the upper room; the agony in the garden; & the betrayal. Above this last scene have been added the arms of Charles the Bold, Duke of Burgundy, surrounded by the collar of the Order of the Golden Fleece, and of his wife Margaret of York, sister of Edward IV, who probably presented the garment to W Abbey. They were married in 1408 by Richard Beauchamp, Bp of Salisbury. The other badges are pre-Reformation 16thC English work, with Tudor roses & Henry VIII's portcullises, fleurs de lis & pomegranites refering to Catharine of Aragon.